A cookbook like no other, Cookery a la Carte is a fun and jam-packed collection, bursting with ingredients, stories and images. 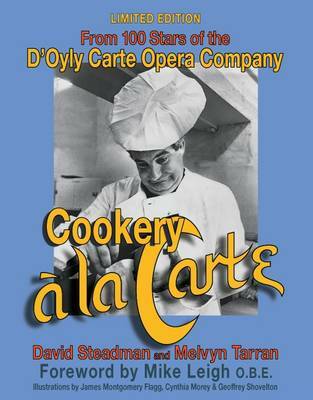 With over 100 unique recipes from members of the D'Oyly Carte Opera Company, biographies of the stars, anecdotes and many rare never-seen-before photographs, this is a must-have for Gilbert & Sullivan fans and foodies alike!Share in the experience of Ann "Drummie" Drummond-Grant's Oven Scones, risk Darrell Fancourt's Silver Streak Cocktail(!) or get messy with Valerie Masterson's Spare Ribs in a beautifully presented glossy hardback coffee-table book, lavishly illustrated with over 700 stage and personal photographs of D'Oyly Carte artistes. The book is further enhanced by illustrations from Cynthia Morey and Geoffrey Shovelton and is produced with the cooperation of the D'Oyly Carte Opera Trust.The D'Oyly Carte Opera Company toured the world performing the operas of Gilbert & Sullivan for over 120 years, and the D'Oyly Carte Trust is still actively involved today in the performance of the Savoy Operas. This collection was begun in the 1930s by Joy Garland when, as Joyce Perry, she sang in the D'Oyly Carte Chorus. On leaving the company to marry Dr.Hugh Garland, Joy was presented with a green leather-bound book, inscribed in gold and entitled Cookery a la Carte in which her colleagues had hand-written some of their favourite recipes. J.M. Gordon, Sir Henry Lytton, Sydney Granville, Bertha Lewis, Marjorie Eyre, Muriel Dickson and Isidore Godfrey were among those who had contributed. After many years, Joy presented her collection to Melvyn Tarran, the owner of the world's most impressive and comprehensive collection of G&S/D'Oyly Carte memorabilia and ephemera. He continued to source new recipes and added material from his collection, and enlisted the help of his friend, the conductor David Steadman.A unique, fascinating and celebratory book revealing many personal and private talents and interests, Cookery a la Carte is also unashamedly a tribute to many favourite Savoyards, some of whom have seldom been shown the respect and acknowledgement they deserve.